“What’s the biggest size you have?” This has to be one of the most commonly asked questions when customers call the Ron Bennett Big Mens Clothing store. If you’re a truly big and tall man, you’re no doubt very used to being told – often in fairly derogatory terms – “sorry, we don’t stock your size”. You are very unlikely to hear that if you call 1800 625 510. The Big Mens Clothing store has the most extensive range of clothing for big and tall men in Australia, catering for chest sizes up to 190cm and waist sizes up to 160cm. Individual brands have very individual ideas about sizing, but if you typically fall within the size range 2XL to 7XL, then Big Mens Clothing has got you covered. 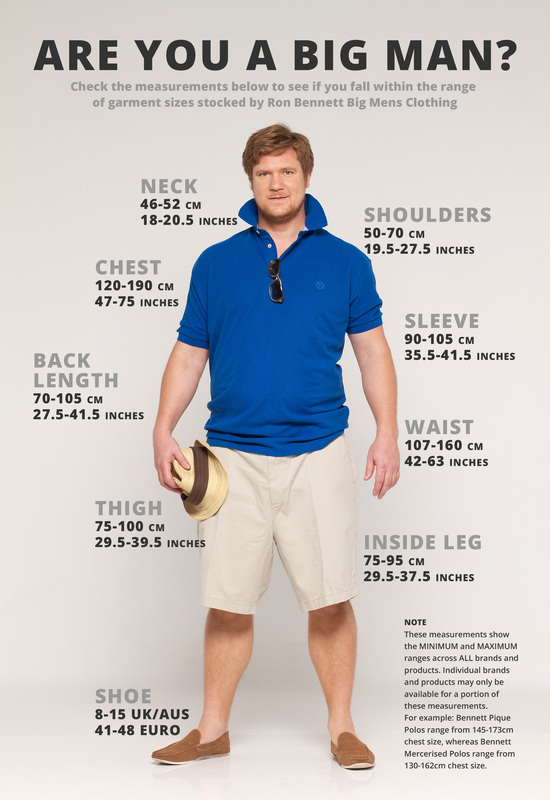 Similarly, many men find themselves at the top end of the ‘regular size’ spectrum (usually XXL), but are not sure if they fit within the big men’s size range. To help you determine if you are a ‘big man’, we have put together an infographic outlining the minimum and maximum range of measurements. But it’s important to note that individual brands and products may only be available for a portion of these measurements. For example: Bennett Pique Polos range from 145-173cm chest size, whereas Bennett Mercerised Polos range from 130-162cm chest size. If you are a big man, contact Ron Bennett Big Mens Clothing.